I think I was 19 when I made my first bucket list of things I’d like to do, from horse-back riding to sailing, rafting, caving, climbing… all sort of things Willie Garvin was good at (minus the knife throwing). Somewhere at the very back of the list was birdwatching. Why at the back? I knew nothing of it – but the fact that it had a geriatric image. The decade was the 1980s and in Yugoslavia it was impossible to get a grip of a field guide. Even the first bird club was founded several years later. Hence, I did a bit of sailing and rock climbing, and a lot more caving… Then a bit more climbing, at the very cliff where it is supposed to be easy to observe wintering Wallcreepers, of which I knew nothing at the time and to this day I haven’t observed any. Seven more metres and I fell, with enough free rope to reach the bottom and break my spine. Two years passed before I found myself looking for a new outdoor pursuit, something to do from a sitting position… And took birding? No, I took a paddle and discovered the Danube backwaters (cover photo: 1995), the very same area I am fighting to protect now, but the Government, it seems, has an interested investor… Seeing the most valuable habitats disappearing in front of our eyes, environmentalists are quite prone to depression, but that is another story. And from the kayak cockpit, I started to bird. The decade was the 1990s, Yugoslavia was dissolving fast and it was impossible to get hold of a field guide in any local bookshop. Also, without any media coverage, it was to be several more years before I discovered that there was a bird club in the country. I started on my own. I had never heard of any other birder in the country. I had no one to ask and had to reinvent the wheel. And while I would advise beginners to look for others and learn from them, having to rely only on yourself has its advantages: you learn how to learn and not to wait for others to help you ID that bird, or even worse, ID it for you. Those are hard-earned lessons, but the best remembered ones. 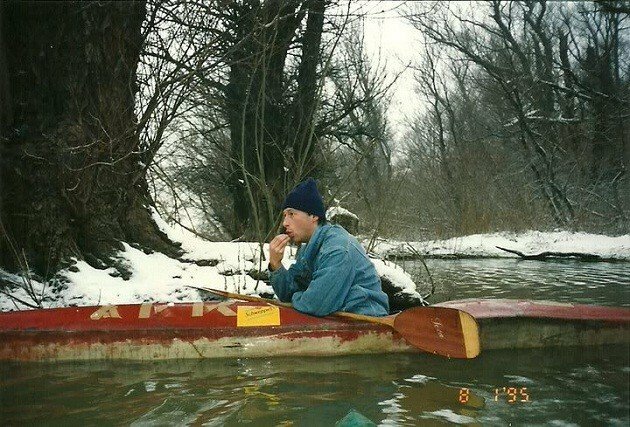 I spent the next few years kayaking the Danube and birding by kayak, before I realised that I had stopped growing and that I did need a bit of advice. Somewhere between the latest TV footage from Bosnia, I saw a pair of ornithologists, one a biology student, the other one the Natural History Museum director, birding the nearby mountain. And I had a friend working in the museum, who put me in touch with their birds curator (with whom I recently birded the Griffon Vulture gorges of western Serbia) and who answered all my questions at the time. While some of my early observations found their way to ornithological journal pages, it was probably the first larger research I participated in, the nation-wide (it was Serbia-wide by then, although the name Yugoslavia still stuck) census of heronries that really made me thinking of methodology. I still believe that choosing the right approach may be the most important phase of any research. The year was 1999, missiles were raining over Serbia and I did not feel like waiting to see if infantry would follow, so I bought a one-way ticket to the Southern Hemisphere. For the first time, I had to pack my entire life in 20 allowed kilograms and would not go without at least one book. Not a field guide for Europe, that is for sure, but which one? “Bird census techniques” by Colin J. Bibby, for that period almost a revolutionary publication, found its way into my suitcase. Merely a month later, I was camping in the Central Kalahari, at the unfenced site that is now closed for campers because the local lion pride became too curious. 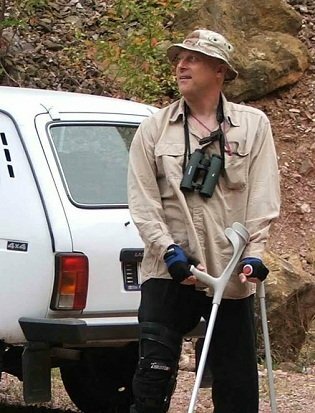 Birding a different continent allowed me to put all my experiences and knowledge into perspective and to discover how much more fun birding could be. The final piece of the puzzle that influenced and formed me was eBird. It is not just a bird observation data base like many others, but more of a community, almost half-way to a very specific social network. And at the same time, a great way to store and organise your bird data. What more would I ask from eBird? One thing is, to allow for species maps to show only data with chosen breeding code so I could depict the rookeries I was searching for this spring. The other is, I would love to see my birding travel maps, that is, the map of all hotspots and personal spots where I have uploaded a list or two. In summary, even three decades later it is still not possible to get a grip of a field guide in any local bookshop… What were the defining factors of your growth as a birder? (1) Bird books in the local library that opened my eyes to the avian world. (2) Indigo Bunting- I just really wanted to see one. (3) Finally meeting another local birder at the age of 12 who took me birding (I started at 7). My #2 was Eurasian Golden Oriole – a common brightly-coloured species easier to hear than see cos it keeps to the treetops… and lives inside cities, too. Last September I saw about 30 in a single day, peak of their migration and I was at the right spot. (5) doing book reviews for this blog; I not only learn from the books I read, I do background reading so I can evaluate what I’m reading. #2 She sure did a great favour to you. #3 Here in Belgrade, I am forced to hide Peregrine sites (mostly wintering), even Goshawks aren’t doing well. In one part of the city, pigeon fanciers hired a sniper to kill a Peregrine that they were not able to poison. And that sniper works for some state agency, he is not a freelancer. #4 I believe all birders like to teach newbies. Makes us think that we actually know something… which is always a questionable statement. #5 Talking of background reading, I’ve translated Clive Ponting’s The New Green History of the World and in the process, did a bit of a research into many areas I am not familiar with. If one want’s to read just one history book, I’d recommend this one. Sadly, the data on climate change is already outdated. We have passed the point from the book; 350 ppm of CO2 and this week are entering the new era of heating with 400 ppm. I liked your story, Dragan. Although I started reading merely for the the cool photo of you in your kayak, I kept reading for the inspiration. Thanks! My wife and I are going to Danube this spring to volunteer at an avian research project for several weeks. We also want to explore by kayak. I’m in awe that you spent two years there kayaking. Awesome!! I’m pretty new to birding. But I’m making up for lost time. Watching birds every day, trying to keep a journal, and about to buy my first pair of binoculars. Birds!! If you could share some advice about the Danube Delta with me I would be truly grateful. I haven’t visited it and cannot say anything from my own experience, but being there during migration must be one of the best Balkan birding experiences… together with watching the raptors, storks and pelicans migrating above the mosques of Istanbul. If you have any specific questions, I could try to get the answers through my Romanian FB contacts. Why Don’t We Try To End Roadkill?